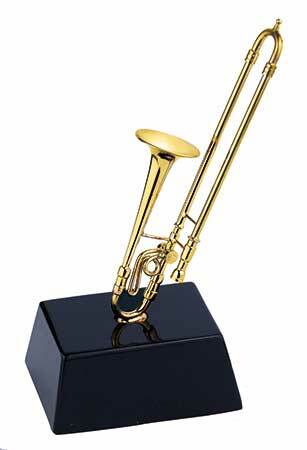 Miniature Trombone on Stand – The Miniature Trombone on Stand is a unique gift idea for a trombonist! Crafted from brass, this figurine was made with impeccable detail! Sitting on top of a black lacquered stand this beautiful sculpted piece would be perfect for a desk or table in the home or office! Anyone who loves horn instruments will certainly get a kick out of this replica. Approx. 5″. Music Gifts for Trombone Players!